[134 Pages Report] The global microplate system market is expected to reach USD 996.9 Million by 2022 from USD 791.7 Million in 2016 at a CAGR of 4.0%. The base year considered for the study is 2016 and the forecast period is from 2017 to 2022. The study estimates the microplate systems market size for 2017 and projects its demand till 2022. In the primary research process, various sources from both demand side and supply side were interviewed to obtain qualitative and quantitative information for the report. Primary sources from the demand side included hospitals, research institutes, and laboratories. For the market estimation process, both top-down and bottom-up approaches were used to estimate and validate the market size of the microplate system market as well as to estimate the market size of various other dependent submarkets. All possible parameters that affect the market covered in this research study have been accounted for, viewed in extensive detail, verified through primary research, and analyzed to get the final quantitative and qualitative data. This data was consolidated and added to detailed inputs and analysis from MarketsandMarkets and presented in this report. Secondary sources such as directories, databases, white papers, annual reports, company house documents, investor presentations, and SEC filings of companies were referred. The microplate system market is highly competitive with the presence of several small and big players. 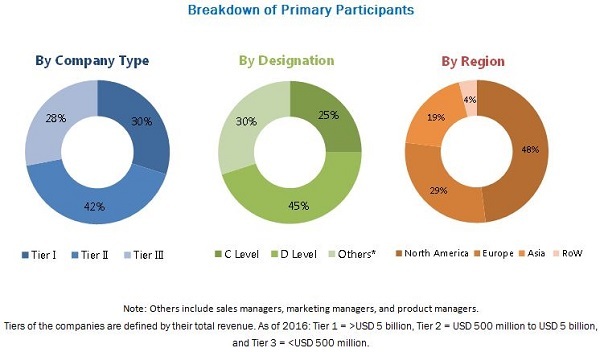 Prominent players in this market include BioTek (US), Danaher (US), PerkinElmer (US), Tecan (Switzerland), Thermo Fisher (US), BMG LABTECH (Germany), BERTHOLD (Germany), Agilent (US), Bio-Rad (US), Promega (US), Biochrom (UK), Corning (US), Lonza (Switzerland), Rayto (China), and Mindray (China). The global microplate system market is expected to reach USD 996.9 Million by 2022 from USD 820.3 Million in 2017 at a CAGR of 4.0%. The growth of this market is mainly driven by growing prevalence of diseases, increasing focus on minituarisation of processes, technological advancements, and increasing R&D expenditure in the pharmaceutical industry. This report segments the microplate systems market into product, application, end user, and region. Based on product, the market is segmented into microplate readers, microplate pipetting systems and dispensers, microplate washers, and other products. In 2017, microplate readers are estimated to account for the largest share of the total market, followed by microplate pipetting systems and dispensers. The growth of the microplate reader segment is attributed to the increasing number of applications of microplate readers in research and diagnostics. Based on end user, microplate system market is segmented into biotechnology and pharmaceutical companies, hospitals and diagnostic laboratories, and research and academic institutes. The biotechnology and pharmaceutical companies segment is expected to be the fastest growing during the forecast period. This growth is attributed to the increasing government support in the form of funding for biotech and pharma research. 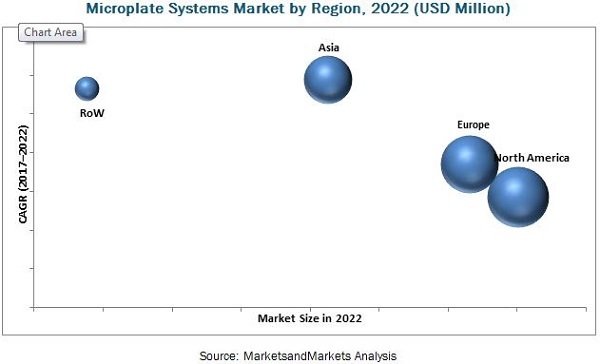 Based on application, microplate system market is segmented into drug discovery, clinical diagnostics, genomics and proteomics research, and other applications. The drug discovery segment is expected to be the fastest growing during the forecast period. This growth is attributed to the rising need for high-throughput assays and ADME toxicity screens for processing a huge number of compounds. In 2017, North America is expected to dominate the market, followed by Europe. The high growth of the North American market is attributed to factors such as rising government funding for medical research and the need for early drug discovery, technological advancements, improving FDA approval levels and a positive sales outlook (allowing pharmaceutical companies to allocate more capital to R&D spending), rising prevalence of chronic and infectious diseases and increasing rising population. While North America is expected to dominate the market in 2017, Asia Pacific is expected to register the highest CAGR during the forecast period. The high growth in this market is attributed to increasing healthcare investment, large geriatric population, and rapid economic growth in emerging APAC countries.